MUST READ: How do I register for a WiFi account (Dummies version)? How do I register for a wireless Internet account? Is the physical address the same as WEP key? Where are the wireless access points located? What if I registered the wrong MAC address? I forgot the WEP key. What should I do now? I bought a new laptop/wireless device. How do I update my MAC address? How do I configure my Windows XP/Vista laptop for wireless access? How do I configure my iBook/PowerBook for wireless access? How do I determine the MAC address of my HP iPAQ/Pocket PC? 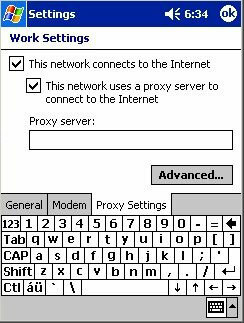 How do I configure the proxy settings of my iPAQ/Pocket PC? Q: How do I register for a wireless Internet account? A: Registration is online so there is really no need to go to CNG to sign up for an account. Please do note that, for security reasons, the registration website is available only within the Ateneo de Manila University local area network. Just go to this link to register or download the MUST READ: Dummies version of this document. Q: Is the physical address the same as WEP key? A: No, the physical address is different from the WEP key. The former is the unique number that is assigned by the manufacturer to the network card. All network cards -- wired or wireless -- have unique identification numbers. It's like a serial number that is electronically stamped into the chipset of your network card. The physical address is also known as the MAC (Media Access Control) address. In the case of Apple computers (iBooks and PowerBooks), the physical address is also known as the Airport address. The WEP key, on the other hand, is like a password which is given to the registered users of the Loyola Schools Wireless Area Network. Without it, you won't be able to access the WiFi network. How do you get the WEP key? You must register for a wireless account. Please download the MUST READ: Dummies version of this document. Q: Where are the wireless access points located? De la Costa Hall garden up to the Social Sciences Building foyer. Gonzaga ground floor cafeteria (AMPC). Gonzaga second floor cafeteria (Hans Gourmet). Quad 1 up to Kostka Hall ground floor corridor. Q: What if I registered the wrong MAC Address? A: If for some reason you registered the wrong MAC address, please go to this URL: https://cng-db.ateneo.net/wireless/request.php and make the necessary corrections. 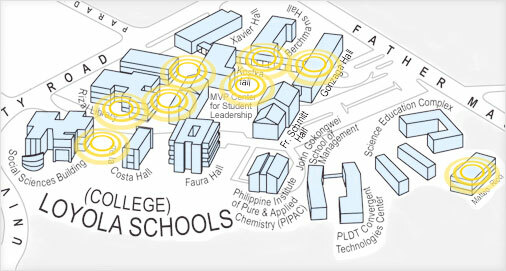 Please do note that for security reasons, the link is accessible only within the Loyola Schools local area network. Q: I forgot the WEP key. What should I do now? A: If you are a registered user and you forgot the WEP key, please go to this URL: https://cng-db.ateneo.net/wireless/request.php. Upon completion of the online form, you will receive an email containing the instructions on how to retrieve the Wired Equivalance Privacy (WEP) key. Q: I bought a new laptop/wireless device. How do I update my MAC address? A: If you bought a new laptop or wireless device and you want to update your MAC address, please go to this URL: https://cng-db.ateneo.net/wireless/request.php. Upon completion of the online form, you will receive an email containing the instructions on how to change the MAC address. Q: How do I configure my Windows XP/Vista laptop for wireless access? A: For XP users, there is a step-by-step wireless connection guide at this site. You may also download a PDF version of this document. XP users, please download the MUST READ: Dummies version of this document. Vista users, please download the MUST READ: Dummies version of this document. Q: How do I configure my iBook/PowerBook for wireless access? Step 1: Configure the proxy server settings of your Mac. Instructions are available at this link. You may also download a PDF version of this document. Step 2: Input the WEP key and SSID you received via email when you registered for a wireless account. Q: How do I determine the MAC address of my HP iPAQ/Pocket PC?